Sylvie Richterová (1945) is a fiction writer, poet, essayist, translator and literary theorist. Since 1971, she has been living in Italy, and after 1989, alternately also in Prague. She writes in Czech and Italian. Before 1989, she worked with magazines and publishing houses in exile and gave lectures at Italian universities. Her first prose, Návraty a jiné ztráty came out in samizdat (1977) and, was later published by Sixty-Eight Publishers. She has won the Czech Literary Fund Foundation prize twice (1994, 2016). Her books have been published in Bulgarian, French, Italian and German. In the preface to her book of essays, the author writes about two constants that have continuously accompanied her during her writing (the texts originated during the period of 1975 to 2015): on one hand, the language drama, on the other, the interconnection of ethics and aesthetics. At the same time, however, she reminds us that literature is great if it grows up in the cultural tradition of its own language and of the whole Europe while newly embarking on things provided to it particularly by the given place and time. 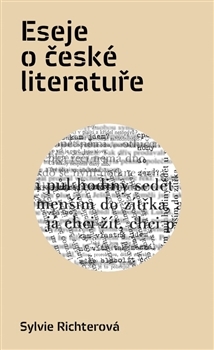 In forty five texts divided into nine sections, she focuses on Jaroslav Hašek and the interpretations of comedy and laughter, Karel Čapek, Czech poetry (from Vladimír Holan to Miloslav Topinka and Ivan Wernisch), journal literature, Milan Kundera, Věra Linhartová, thematological and anthropological analyses, the position of the writer in society in relation to phenomena such as communist dictatorship, and John Amos Comenius. And she does so in language that is not designed just for literary scholars.